VAV is one of the first inaudible soundwave solutions of its kind, and this is why it’s gained some notice in the Venture Capitalists circle, with a Digital Innovation Fund early this year and a previous funding from Cradle Fund. 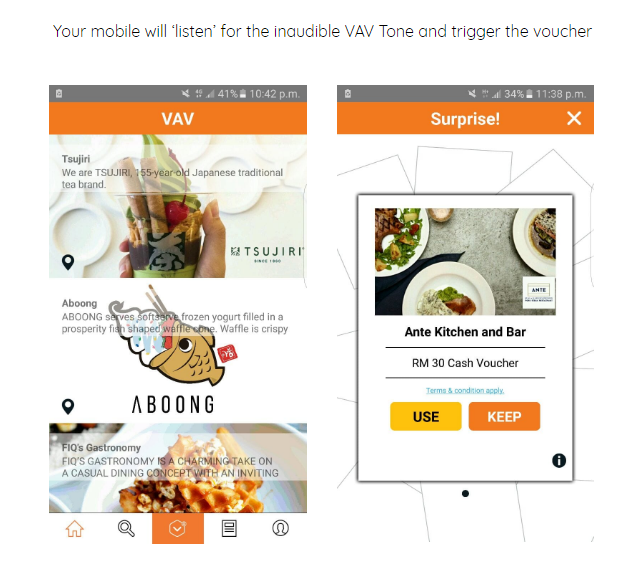 With cash in hand, VAV has taken to commercialise their product with collaborations with notable brands like Maybank, Astro 304 (Kah Lai Toi), HomePro and Summit USJ. VAV is a service that transmits inaudible soundwaves that can be converted into digital messages on your smartphone. These sounds can be transmitted using anything from television, radio, websites like Facebook and YouTube, to even speakers at a live music event. It can basically be applied anywhere that there is sound. This can take multiple forms, like a vote-style reality TV show sending over the vote counter straight to viewers’ phones instead of them having to go through the hassle of dialing in, a shopping mall being able embed vouchers for shoppers already in the mall, to even artists at live stages sending over their album details over their songs. As long as there is a source of sound, only creativity will limit what types of messages can be sent to engage the user. And that spells good things for the advertisers, but the messages will fall on deaf microphones if phones don’t have the VAV app installed in the first place. 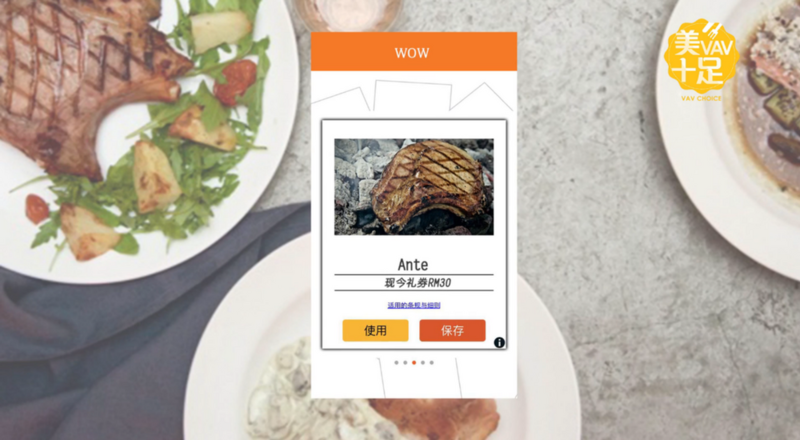 So to bring in more of the common folk into their fold, VAV is positioning itself to the consumers as a deal magnet, where your phone will bring the deals to you. He runs the show along with co-founders Addie Leon Qi Jie, and Wan Kamarul Zaman Bin Wan Yaacob, ex-CEO of Affin Discount, also a banker, lawyer, and corporate consultant. It’s also about creating value so that users want to keep using VAV. To achieve this, the app interface definitely feels like a deals app. VAV listening for audio cues from this video. Since the mic of your phone has to be on for VAV to work, this has raised some issues in regards to privacy. Who is to say that the app isn’t picking up anything you say near your mic and sending your private conversations over for people to listen to? The team further assures that any audio is not stored on any devices; it is simply a tool to execute messages sent over. While we’re inclined to buy it thanks to how, the legal and public ramifications of misusing a user’s privacy and security can be deadly to this type of startup. On top of that, the microphone does not tacitly listen all the time, and it is down to the discretion of the user to enable the listening option before it will send users with deals. VAV also mentions how they do partner with large corporations. This includes of broadcasting companies and this requires them to get the approval from their relevant stakeholders, who often would have the same concerns. To this, a user’s trust in VAV can probably go as far as they trust these corporations. Considering how unique their product is, it does take a bit of convincing on their end to bring the aforementioned corporations on board. Since their funding with Axiata, they have made clear their interest in expanding out of Malaysia, and they’ve seen some progress in that area. As consumers, we are at least glad that this is not just yet another way for advertisers to spam ads to users. Thanks to its model as a deal-provider, advertisers have to provide some value for the users and not to mention that it requires the users’ consent to even get deals in the first place. We may only have their word in terms of not storing any data, but it’s clear that they are getting a lot of interest from advertisers, based on the partnerships they are gaining. Feature Image Credit: Screenshot of this video uploaded by VAV channel.